We deliver to every address within the UK that Royal Mail reaches. We also ship to countries both within Europe and internationally. Please see the table below for a breakdown. England, Scotland, Wales, Northern Ireland Subscriptions, Bars, Hampers, Wine Gifts, Gift Boxes, Couverture, Craft Chocolate Collection 3-5 working days 1-2 working days (DPD is fastest) FREE Royal Mail Untracked. Value of over £50 = FREE Royal Mail Tracked. Hungary, France, Spain, Netherlands, Republic of Ireland, Belgium, Denmark, Poland, Germany, Austria, Czech Republic, Luxembourg Subscriptions, Bars, Hampers, Gift Boxes, Craft Chocolate Collection with a limit of £200.. 5-7 working days 3-5 working days £2.50 Royal Mail Untracked. Portugal, Lithuania, Estonia, Latvia, Italy, Finland, Sweden, Slovakia, Greece Subscriptions, Bars, Hampers, Gift Boxes, Craft Chocolate Collection with a limit of £200.. 10-15 working days 3-5 working days £2.95 Royal Mail Untracked. Cyprus, Malta, Norway, Iceland, Slovenia, Monaco, Croatia, Slovenia, Switzerladnd, Romania Subscriptions, Bars, Hampers, Gift boxes, Craft Chocolate Collection with a limit of £200. 10-15 working days 7-10 working days £2.50 Royal Mail Untracked. AUSTRALIA & NEW ZEALAND Subscriptions, Bars, Hampers, Gift Boxes, Craft Chocolate Collection with a limit of £200. 10 – 15 working days 7 – 10 working days £4.50 Royal Mail Untracked. Canada, USA Subscriptions, Bars, Hampers, Gift Boxes, Craft Chocolate Collection with a limit of £200. 15-20 working days 7 – 10 working days £4.50 Royal Mail Untracked. Hong Kong, Israel, Japan, India, Malaysia, Russia Subscriptions, Bars, Hampers, Gift Boxes, Craft Chocolate Collection with a limit of £200. 20-30 working days 7 – 10 working days £4.50 Royal Mail Untracked. Singapore, Lebanon, Oman, South Africa, Chile Subscriptions, Bars, Hampers, Gift Boxes, Craft Chocolate Collection with a limit of £200. 10-15 working days 7 – 10 working days £4.50 Royal Mail Untracked. Albania, Bulgaria, Brazil, China, Ecuador, Colombia, Egypt, Pakistan, Papua New Guinea, Peru, Georgia, Russia, Taiwan, United Arab Emirates, Ukraine, Vietnam Subscriptions, Bars, Gift Boxes, Craft Chocolate Collection with a limit of £200. 10-15 working days 7-10 working days £4.50 Royal Mail Untracked. Please note: We do not ship items on weekends or bank holidays. Our warehouse ships all items before 12 noon UK time so if you place an order after this time, the item will be shipped on the next working day. These time frames are guides and delays may occur so please select the upgraded option where possible. The chocolate is not shipped with ice packs and the boxes are cardboard and do not have thermal insulation. If you are ordering at the height of summer or delivering to somewhere very hot, please do keep this is mind as we cannot guarantee that the chocolate won’t melt. We do everything we can to make sure your chocolate will get to you in one piece, but once the chocolate leaves our warehouse we cannot control the conditions the chocolate is exposed to. Chocolate melting, theft or breakages are at the customer’s own risk. We would also like to clarify that we are not responsible for tracing orders missing in the post. If you would like to be able to track your orders we do provide an upgrade option for customers to have greater peace of mind at checkout. We can confirm dispatch date from our warehouse but after this, the customer must consult their local postal service. Please bear these dates in mind when making a purchase. 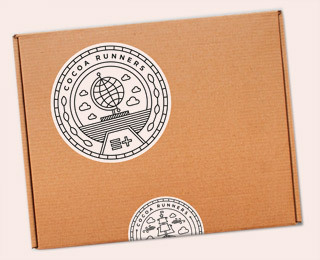 If you have any queries about delivery options or concerns about your order status, please contact us at team@cocoarunners.com. We want you to get your hands on the chocolate quickly, so we’ll send your first box straight away. Subsequent monthly boxes will be sent out in the week of the third monday of the month. We send these boxes out Tuesday to Friday during this week. Our monthly boxes are designed to be “letterbox friendly” and to fit through nearly all UK letterboxes. The dimensions of our box are 18.3cm wide x 2.4cm thick x 29cm long. If you’re worried, you can have the chocolate delivered to your workplace instead. You do not need to be in to sign for deliveries. We deliver to every address within the UK that Royal Mail reaches. We also ship outside of the UK for additional charge (see table above). We cannot offer tracked or express shipping for subscription boxes. As with other orders, chocolate is not shipped with ice packs and the boxes are cardboard and do not have thermal insulation. When you buy additional bars from our Chocolate Library, we aim to send out all deliveries the next working day. If you order before 12.00pm (BST) we will try and send out your order the same working day. For up to 12-16 bars we can keep your order “letterbox friendly” (more than 6 bars will come in two separate “letterbox friendly” boxes). For larger orders we will send a parcel for which you need to sign. Our chocolate will melt in extreme heat so please bear this in mind if you are looking to buy chocolate in summer. If you’re placing a single order that just can’t wait, we would recommend ordering at the beginning of the week using expedited shipping. If you have any other questions, please check our Terms & Conditions or get in touch.